Founded by Open Society Foundations and the World Bank in 2005, The Roma Education Fund (REF) is an international nongovernmental organization headquartered in Budapest, Hungary. Its mission focuses on closing the gap in educational outcomes between Roma and non-Roma across Central and South Eastern Europe and the Balkans. The REF helps students excel in all levels of schooling and uses its funds to design specialized programs. Instead of blindly implementing programs, the REF looks at what is most needed in these areas and finds ways to create successful programs. 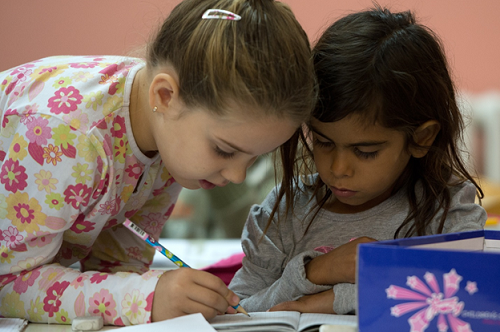 As a result of these programs, Roma children are more successful; previous statistics show a decrease in drop-outs in the fourth and fifth grades. Many are now completing primary school and going on to secondary school. The Roma community continues to face social exclusion, causing a huge impact on the life of families and children. The term “zero class” is one that has been used publicly by those in the surrounding communities who do not recognize the legitimacy of the Roma community. Special schools and segregated schooling are causing a tremendous amount of damage not only to Roma children and their communities but also to society as a whole. Part of the efforts undertaken by the REF includes advocating the idea that states should invest in Roma children at a young age in order to combat poverty and social exclusion, an investment that has been proven to make a change. The Roma Education Fund’s initiative has seen significant improvement in only nine years due to the introduction of quality educational services into extremely deprived and isolated communities, and the organization has made a difference to Roma youth as they grow into Roma elite. Since its establishment, the Roma Education Fund has reached thousands of beneficiaries through grants, scholarships, technical assistance, policy-making, and advocacy. It is critical to human rights everywhere that the world understands and appreciates the rich culture of the Roma population. The REF is goal-driven to make an impact in the lives of the Roma population and continues to find ways to promote Roma inclusion. With its continued effort to implement inclusion the Roma community, the REF is likely to succeed in helping future generations combat discrimination and promote equal treatment of all people. Top right photo: Students enrolled in REF’s Secondary School Scholarship Program react at the Jana Bocatia School in Kosice during the last week of classes before graduation. The final week at this vocational school allows graduating students to rehearse their practical exams and put the final touches on their skills before leaving for further studies or the labor market. REF’s Secondary School Scholarship Program has enabled hundreds of participating Romani students to complete their studies and dramatically reduced dropout rates. Lower photos, top row (L): Beneficiaries of Roma Memorial University Scholarship Program sign their contracts during a REF-hosted empowerment event in Skopje, Macedonia to honor their achievements and inspire their further studies and success. Roma Education Fund and Macedonian government cooperation have resulted in some of the most universal, inclusive and ground-breaking educational policies in the region. Lower photos, first row (R): Young Romani and Egyptian residents of Konik Refugee Camp are being bussed to and integrated in mainstream Montenegrin schools in the nation’s capital, Podgorica. After years of attending a substandard branch school, and the limbo of living in the camp, children like Hanna are having their first real opportunities to access quality, mainstream education and come in contact with their Montenegrin peers, with additional tutoring and mentoring provided by REF in conjunction with a broad coalition of partners, including the Montenegrin Ministry of Education. 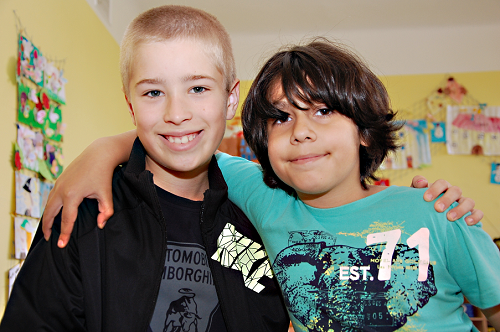 Lower photos, second row (R): A Romani and non-Romani boy enjoy a spontaneous moment during a break in lessons in an integrated lyceum in Prague, Czech Republic. Romani students at risk of early school leaving receive tutoring and mentoring to keep them attending this mainstream school in Prague with the aim of completing their studies. Romani students in the Czech Republic lag well behind their mainstream peers regarding many educational milestones, and they are often corralled into so-called special or basic schools from a young age, effectively excluding them from mainstream Czech schools. Photos provided by The Roma Education Fund.